This solution is easier to understand. You can use the example tree above to walk through the algorithm. The basic idea is have 4 pointers to move towards right on two levels (see comments in the code). in your first solution that second if statement ( if(root!=null) ) is redundent. But that would not be constant extra space. It would require O(log(n)) space where n are the number of nodes in the tree. The question specifically mentions no extra space. I came up with this solution which seems more easily understandable. 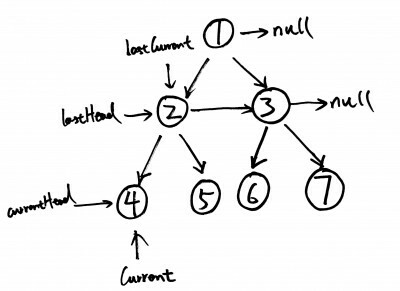 Do a typical level by level binary tree traversal using a queue. When you encounter that the level is changed, navigate from the queue and update next pointers.